Last night was the MTV Video Music Awards, which honestly, I don't care for overall, but they had one performance that I HAD to watch - a twenty one pilots (purposefully NOT capitalized) and A$AP Rocky mashup. You can check out the full performance on the MTV website HERE, but I thought I'd share the songs that were in the performance. 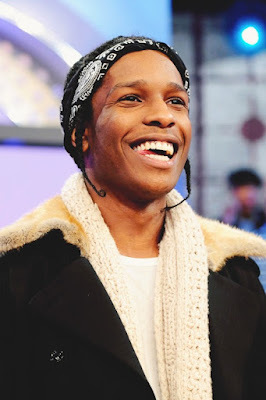 Unfortunately, Freegal does not feature songs from twenty one pilots, but here are some A$AP Rocky songs you might like. If any of these catch your eye, head on over to Freegal and download them all for FREE! Yeah, our choices are eclectic, but at least you get a good mix here! 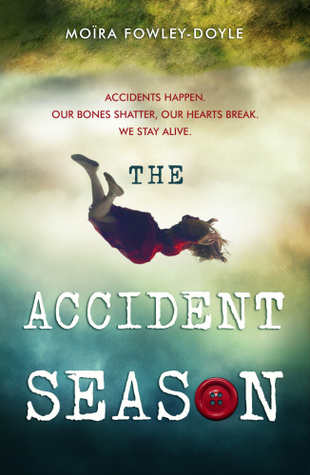 Every year during October, Cara and her family are inexplicably prone to accident and injury. They ban anything too hot or too sharp, cover every hard surface and sharp corner with padding, and try to make it through each school day without fuss. Still, cuts and bruises become a way of life, though those are the least of their worries this year. Classmate Elsie has gone missing, and no one seems to remember she even exists. As Cara unravels the Elsie mystery, she also comes closer and closer to discovering the source of her family’s curse. This book is not what I expected. I figured there would be a witch, definitely a ghost or two, and maybe even a Great Moral Lesson for what exactly is causing so much trouble for this family. This book is all of that and none of that. First of all, Fowley-Doyle’s writing is absolutely stunning. This is a slow burn of a story, which can be off-putting for some people, but I found myself incredibly intrigued by the magic woven in each word. By description alone the story sounds like it would be scary, but it’s not. It’s triumph and tragedy wrapped up in an eerie little package, and the fact that it refuses to pigeonhole itself into any particular category really works. I’ve never felt as haunted by a book as I was this one. The characters are all really solid, too. Everyone is just a tiny bit off and unpredictable. Our protagonist, Cara, is very sweet. She wants the best for her family and sees the good in people and situations, but often ignores the obvious warning signs that something is wrong. Alice, her older sister, will break your heart. There’s clearly something going on with her, but it takes a long time for it all to come to light, because she’s so good at pretending and everyone else is good at letting her pretend and even allowing themselves to believe it. Sam, their ex-stepbrother, is a rock that grounds them all. It’s painful to watch him break. And Cara’s spooky best friend Bea is the glue that holds them together, even when she can’t keep herself from falling apart. I can’t say too much, because even though there are things you see coming, the way the whole story comes together is beautiful to watch. The story is told from Cara’s point of view, and with that comes her imagination. There is sometimes no indication as to when her reality slides into the unreal, though that’s kind of the point. As a reader, you’re never sure what exactly is real and what’s not, and in the end, it doesn’t really matter. HEADS UP: There is some potentially triggering content, though it’s not at all graphic and more heavily implied than anything else. 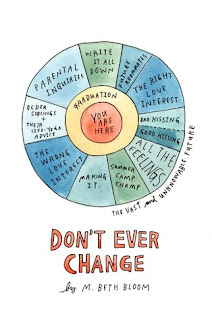 Also, there is a particular relationship that may be a little weird for some, so if you’re unsure, you may want to spoil yourself just a teensy bit ahead of time. Even so, knowing what happens doesn’t make the writing any less beautiful. You’ll have to determine for yourself whether this is your particular cup of tea. That said, it’s definitely mine. Want to check out The Accident Season? Find it on the CMRLS catalog and put it on hold! Meet Nimona, the small but vicious shapeshifting sidekick of Lord Ballister Blackheart, the kingdom’s most notorious supervillain…or is he? Watch as they set out to show the kingdom once and for all that The Institution of Law Enforcement and Heroics and their poster boy, Sir Ambrosius Goldenloin, are the real villains. But what will it cost them to prove it? Full disclosure: I’ve loved Noelle Stevenson for a long time. At only 23 years old, she’s published Nimona and co-written Lumberjanes (both of which are on their way to the big screen), as well as won multiple Eisner Awards. She’s also one half of the duo responsible for The Hawkeye Initiative, which is one of the funniest things on the internet in my humble opinion. I’ve followed her on tumblr and watched Nimona come together as a web comic piece by piece, and I enjoyed every minute of it. Nimona is heartfelt, symbolic, and completely hilarious. I don’t want to give too much away, so I’ll try to keep it vague. Blackheart, our dastardly villain, does not believe in collateral damage. This is the main reason why he hates the Institution so much. Well, that and the fact that they booted him when he lost his arm in a jousting “accident” with Sir Goldenloin, and since they needed a villain, that’s what he became—whether he liked it or not. Nimona, on the other hand, has no problem murdering whole rooms full of people. While she comes off as cheerfully bloodthirsty in the beginning, we quickly realize that there is far more to her past than we can even imagine, or even want to. Together, they team up and start to dismantle The Institution through heists, manipulation, and general buddy-cop shenanigans. I love Blackheart. He’s a good guy with a bad rap. Who can’t get behind that? I’m also strangely fond of Sir Goldenloin, because even though he’s a huge doofus and his actions are often inexcusable, they’re not unexplainable. The quiet implications of his background with Blackheart that are threaded throughout the story are intriguing (and adorable). Nimona, though. Nimona is a true gift. Nimona can go from zero to homicide in a nanosecond, which makes her incredibly unpredictable. She can change not just her appearance, but her strength and mass at will. She wants to help, but she doesn’t always know how to help without hurting people. She is both a sad, scared child and a girl who holds enough rage inside her to burn down the world. I love her so much. The story is vibrant and funny, the set pieces are bizarre and brilliant (knights with swords and armor that also conduct scientific experiments), the artwork is so cute and so beautiful, and it’s just a really, really good time. Seriously. Go read this right now. You won’t regret it. 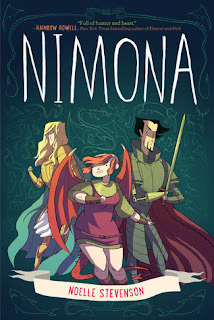 Want to check out Nimona? Find it here on the CMRLS catalog and place a hold on it! Collaborative Music Monday: RANDOM SONGS! "Put me in the dirt, let me dream with the stars." "Can we create something beautiful and destroy it?Nobody knows I dream about it, this is my imagination.If every living thing dies alone, what am I doing here?" It wraps me in the sparkling twilight." "I once heard the worst thing a man can do is draw a hungry crowd. But leaving out his doubts." "Yeah, you got some silverware, but really are you eating though?" Miguel Jontel Pimentel is one of my favorite alternative R&B artists ever. His album Kaleidoscope Dream single-handedly earned that spot on my list within just a few short times of listening to it. Miguel is pretty explicit, so definitely take a note of that in case that's something of importance to you. He is all about puns and metaphors and provocative and painterly language dealing with intimacy, and I absolutely love it. So if that sounds like something you can get down to, you should definitely check him out. I'm going to have the same kind of setup as Stefani did last week and just throw some quotes in. "My mama said the greatest things in life are free. What about lust? What about trust?" "Body language like piano keys"
"Daydream, my body's waving a white flag"
4. "Candles In The Sun"
"Hey, I say we're all created equal. That's what they teach us, but that ain't how we treat each other"
"I wish I could paint our love - these moments and vibrant hues"
If any of these catch your eye, head on over to Freegal and download them all for FREE! 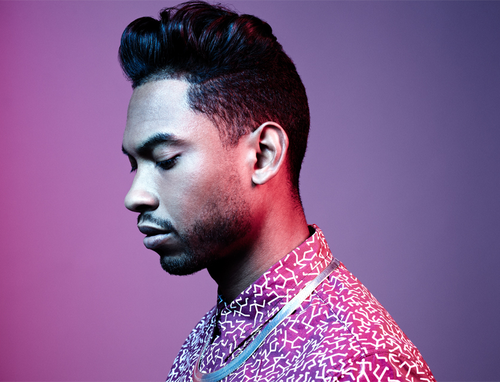 But basically, you just need to listen to Kaleidoscope Dream and be on the people-in-love-with-Miguel train with me. This is a new book that landed on our shelves a couple of weeks ago, and I was intrigued by the description and the cover. When I first read the synopsis of this book, I thought that Eva, the main character, would be someone modern and relevant in all of the right ways, but honestly she is entirely too opinionated and jaded. She is this aspiring teenage writer who wants to experience life in order to be able to become better at writing, and she has this almost deluded perspective that she is so different from society and cannot relate to anyone - not even her own family. In reality, I believe that she is a little too prideful, narcissistic and close-minded for me. She pretty much remains this way for the majority of the book with little to no character development, so unfortunately, even in the end I was not a fan of Eva. The book starts out with Eva thinking she's a good writer, but when her English teacher states otherwise, Eva sets off to go out and experience more in order to write more. The summer before her first semester at college, Eva decides to "live" and soon finds her life changing in ways she had never expected. She decides to explore the unknown and seek employment as a camp counselor for middle grade kids, and it is a disaster - and not even because of her inexperience. She isn't very open to things that she doesn't understand, nor does she have very much optimism about working at this camp - even though she literally signed up for it to broaden her horizons. Throughout the book, she talks about her two best friends, but it seemed like almost every other chapter she just treated them so poorly. When she's not working at the camp or treating her friends like crap, she is in this black hole of a relationship triangle where she bounces from one guy to the next just so impulsively. I understand that teenagers can tend to be a little more impulsive, but she was just careless and not smart at all - though she boastfully claims otherwise.. Her rigidity and sour attitude are an obstacle in every area of life, and she almost has a superiority complex that is completely undeserving. I'm all for wit and snark, but only when ultimately used in a respectful manner and not too liberally. She feels the need for every single word to be clever and funny, and it loses its value entirely too fast because of overexposure. In the end, Don't Ever Change seriously missed the mark for me. Eva was annoying and the relationships she had were unbelievable. The premise was promising, but Eva ended up being selfish, self-centered, and very pessimistic. If you don't like books with annoying characters who you just can't connect with, I'd say to skip this one. 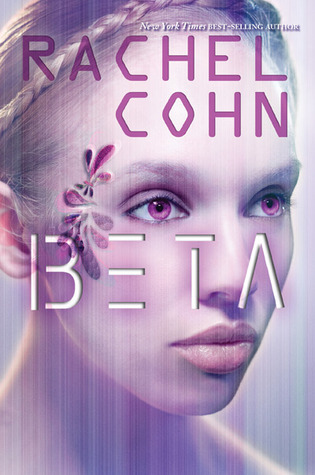 Beta is an intellectually stimulating and emotionally engaging story of identity and free will that will have you on the edge of your seat. In Beta, they live on an Island called Demense, where only the wealthiest people in the world live. Beta tells the story of Elysia, a first in a teenage line of clones. She is not able to experience emotions or desires. Elysia is only a toy, a servant, to the people. She’s 100% expendable. Any signs of being a “defect” will result in immediate termination. But, what happens when Elysia finds out she might actually be a defect? Will she fight for her freedom? Beta is a jaw-dropping, well-written story with many ups and downs that will keep you guessing. The only complaint I could have about this amazingly beautiful book is the ending. My goodness. A cliffhanger you would never imagine. Overall, I really enjoyed this book. It was a serious page-turner with all kinds of plot twists. I recommend this book for a new, thrilling dystopian series, and I cannot wait to read the next one. Want to check out Beta? Find it here on the CMRLS catalog and place a hold on it! Here are five of the songs I’d recommend listening to by The Neighbourhood (unfortunately, my favorite song, “Afraid”, is not on Freegal – though the video is!). I’m going to do it a little differently this time and give you the song title and my favorite lyric from the song. 2. Let It Go on I Love You. 4. Alleyways on I Love You. 5. Float on I Love You. I could seriously go on and on, because, really, I think you should listen to all of their songs. BUT if any of these catch your eye, head on over Freegal and download them, or check out some of The Neighbourhood’s other music! All you need is your library card and pin number, and you’re good to go! Insignia is a very technical, sci-fy and action packed oriented book, and I love it! The set up is an understanding, common way to reach towards the readers, and the main character is relatable to us, and our nerdy habits. Tom Raines is an expert gamer that uses his skills to pay rent- and by rent I mean finding any hotels with cheap prices and trying to maintain a decent living with his drunkard, gambling father. Tom has acne, short height, scrawny, and his life is just terrible; however, all that could change completely with a simple "yes". I enjoyed the premise of the book, however, there's no mistake that the plotline is repetitive, but the characters do make up for the plot itself. Each character has their own unique quality that shines through each page, and the interaction is sentimental, which makes you focus more on them instead of the story. Now for the story: it's military centric, and describes a lot of technology, numbers, coding, and other techno science stuff. Oh, and with advance vocabulary. The characters go through youth training, so there's not going to be any deliberate fighting, but military fighting isn't the same as our 21st century fighting. World War III is in effect, however, war is battled through the galaxy. Each planet is being dominated for possession, and considering human nature, the world is fighting to control which part of the planet and solar system. Androids are battling it out without human bloodshed, such a genius idea, no? Tempting, but there's a lot behind the scenes that propaganda won't tell you. Masses of riches are being produced, and waves of money-hungry investors are ready to get their hands on it. Besides the military and political agenda, Insignia has cool features of advanced gaming systems, holograms, and incredible microchips that could transform society into something bigger, better, and very dangerous. I would indulge further on the technology, but it'll lead to spoilers, so, I'd say it's going to get very technical in the book. There's barely any swearing, but I'll just place a warning for curious young readers. Action is abundant, but it's artificial action, so there's nothing to sincerely worry about (or is it?). If you can handle advanced words, technology being described every other page, and action, then I would recommend this book. Personally for me, I'd give it a 7.5 out of 10. 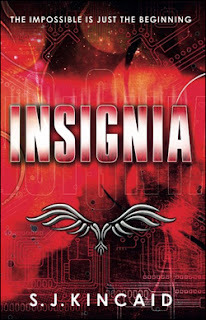 Want to check out Insignia? Find it here on the CMRLS catalog and place a hold on it!